Price: $800 US Dollars, plus any applicable sales tax and shipping. Please call (925) 754-8858 during business hours Pacific Time, or email: smquong@gmail.com to place your order. 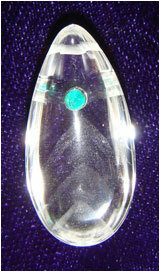 Egg-shape pendant, custom-cut from optical quality, flawless Brazilian natural quartz crystal. Drilled, polished, and filled with turquoise blue-green color, Paraiba tourmalines, floating in a matrix of organic jojoba oil. Various sizes and shapes, approximately one inch length, and drilled for a necklace. These pendants have been blessed with several Ganesha and Sri Chakra Pujas to imprint them with healing energies. Regular weaing of this pendant can boost the immune system, help with stress control, anxiety, worry, and central nervous system issues. Dowsing studies show that the inner aura (pranamaya kosha) will expand 15-20 times its normal radius, when this pendant is worn near the thymus gland. It is suitable for wearing by almost all people, and espcially useful as an astral talisman for the planets Venus and/or Mercury. Only two pendants left in stock. Price: $222 USD plus any applicable sales tax and shipping. Brazilian, natural quartz crystal pendant, drilled and filled with golden-yellow Spessartite garnets, floating in a suspension of organic jojoba oil. Various sizes and shapes from 25-30 mm. Suitable for use as an astral talisman for the planet Jupiter. 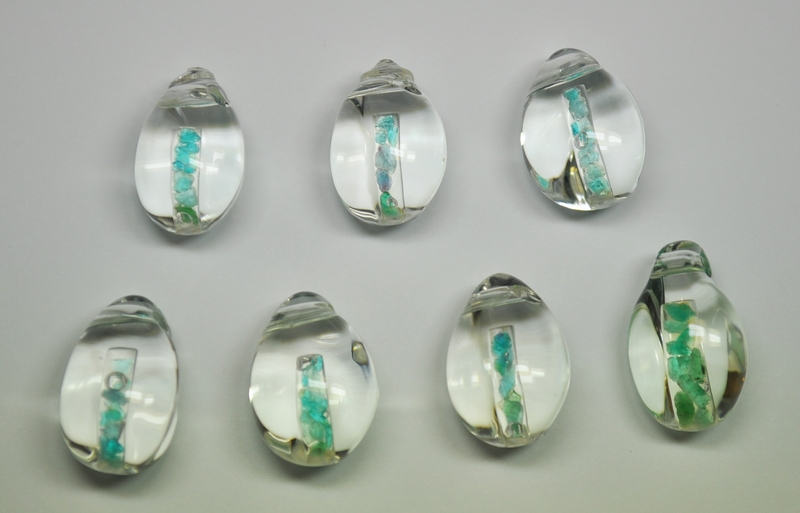 Teardrop-shape, Brazilian natural quartz crystal pendant with 10 exquisite phantom points and a gem quality light blue Paraiba tourmaline set in the front. Drilled for necklace. Approximately 31 mm high, 15 mm wide. Suitable for use as an astral talisman for the planets Venus or Mercury.